"Some day I want to own a truck stop and cook this for some truck drivers that are looking for a little home cookin'. This is my recipe for juicy pork chops, you can deep fry or pan fry them, and they are delicious! It may sound strange but trust me they are GOOD!" In a medium bowl, whisk together the eggs and milk until well blended. Run the pork chops under water then roll in the cracker crumbs. Dip into the egg mixture, then back into the cracker crumbs. Make sure the chops are thickly coated. Heat the oil in a large skillet over medium-high heat. Fry chops until golden brown on both sides. Add water to the skillet, just enough to almost come to the top of the pork chops. Dissolve the chicken bouillon cube in the water. Reduce heat to medium-low, cover, and simmer until the pork chops absorb most of the water, about 15 to 20 minutes. To deep fry, skip the water and bouillon cube. Heat frying oil to 350 degrees F (175 degrees C). Fry coated chops for about 10 minutes or until golden brown. Season with salt and pepper immediately after. They come out moist and delicious. Sweet and savory chops with a nutty crunch! Okay so I didn't have Saltines but I did have Captain Crunch cereal. Unbelievable! I can't believe how the sweetness of the cereal flavors the pork perfectly. Mangia bene! Good recipe. 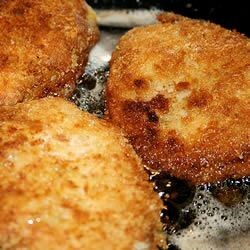 Nice alternative to fried pork chops made with bread crumbs. I didn't bother to make the sauce.